There are just five games left in the Premier League campaign and just two teams left in the title race. Like Liverpool they also have an active part in this season's European campaigns. 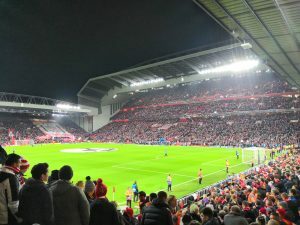 They are progressing nicely in their aim of reaching the Europa League final, and with it a potential top group seeding in next season's European Cup. Five years ago Chelsea played a pivotal role in ending Liverpool's Premier League ambitions when a run of 11 consecutive Premier League victories was ended at Anfield. The infamous Gerrard 'slip' that allowed Demba Ba to give Chelsea the lead, before Willian scored late on to make it 2-0. And not only that but Chelsea were the last team to win at Anfield. They won here back in September to knock the reds out of the League Cup. There is little margin for error once again as the reds host the men from the Bridge. 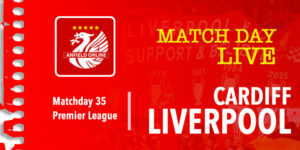 This game is the last to be held before the 30th anniversary of the Hillsborough disaster, and the first following the death of former reds midfielder Tommy Smith who was aged 74. 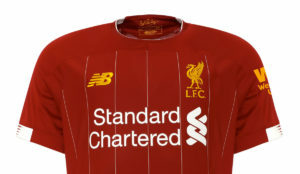 Tributes are expected to be paid before kick off by Liverpool supporters. Today marks the 200th competitive game as Liverpool manager for Jurgen Klopp. He currently has 111 wins and just 36 defeats in his reds career so far. Liverpool have had a slightly longer break here than Chelsea. The reds playing on Tuesday night, Chelsea on Thursday night. 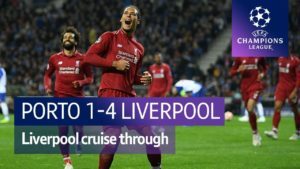 Will the extra 'rest' give Liverpool an advantage or is it a load of old codswallop? Andy Robertson replaces James Milner, whilst Joel Matip returns to replace Dejan Lovren. Maurizio Sarri brings back the big guns that he rested for the Europa League game. Just ahead of kick off Man City have returned to the top of the league with victory away at Crystal Palace. They have a one point lead at the top of the Premier League. Both teams having played 33 games. Liverpool have to get a result today. It's Michael Oliver today in the middle. Making just his second appearance at Anfield this season after refereeing the reds 5-1 win over Arsenal in December. The last time he was involved in a Liverpool game was the 0-0 draw away at Old Trafford in February. Applause before kick off for Tommy Smith, who died yesterday at the age of 74. Smith spent 16 years with Liverpool from 1962 until 1978, and collected 4 titles, 2 FA Cups, 2 UEFA Cup's and was also part of the team that won Liverpool's first European Cup in 1977. It's a good rendition of YNWA ahead of kick off. And a minutes silence on the eve of the 30th anniversary of Hillsborough. 4' Ball played through to Eden Hazard but he's well offside. 6' The fans are singing Salah's name and Mane sends in a cross. It's a half-volley by Salah inside the box but it's straight at Kepa. 10' Magnificent tackle by Fabinho and Hazard is still down. The Belgian is making the most of that - it was a great tackle. 12' Hudson-Odoi crosses in and Alisson beats that away to safety. He was under no immediate danger but it was a powerful punch from the Brazilian keeper. The world's two most expensive goalkeepers on the pitch today with a combined transfer fee of over £150M! 13' You can tell Keita's feeling a bit more confident in this Liverpool team. The tricks are out. He's had a couple of bursting runs forward and now he's unleashing the stepovers. It's been mostly Liverpool so far. 15' Ball in the Liverpool area. 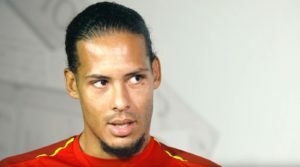 Van Dijk tries to shield it expecting Alisson to be there. Hazard nicks the ball away from him causing a moment of panic, but Liverpool eventually clear. 19' Keita involved again - tries to thread a ball through into the danger zone but Kepa intercepts. 20' Hazard twisting and turning in the box, but his shot is collected by Alisson. 23' Good work by Liverpool, Keita and Mane 1-2 and then it's back to Robertson. He drills it across the area but it comes off the back of Roberto Firmino's thigh and out for a goal kick. Chelsea are pressing high up the pitch. It's going to be counter-attack city for both sides today. 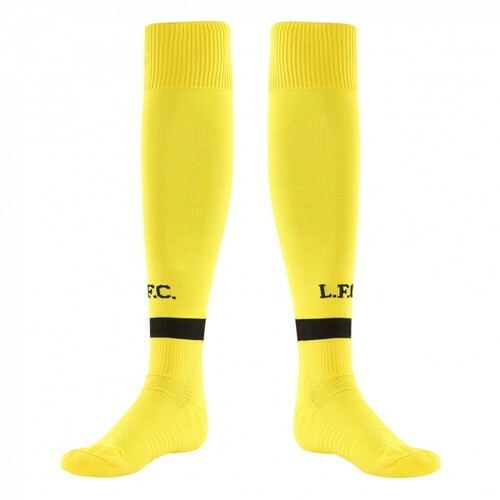 26' Liverpool corner. Salah knockdown and Henderson's shot is deflected by David Luiz behind. 28' Azpilicueta comes right through the back of Sadio Mane. He waves to him to get up but that was a physical challenge. 30' Long ball up and Willian is on to it. He heads towards goal, Liverpool's defenders try to close the gap. He does get the shot away but drills it wide. 33' Chelsea doing a good job so far of keeping Liverpool from getting that final ball in. Just the one gilt-edged chance so far for the reds. 39' Rudiger down for the second time in this game. Think he has some sort of knee issue. He could be going off requiring a change in Chelsea's central defence. 40' Forced by injury. Rudiger hobbles off and is replaced by Andreas Christensen. 44' Lovely delivery from Alexander-Arnold and its a great chance but Kepa saves. Azpilicueta gets a yellow card for another foul on Mane. Two good Premier League sides in action and they can't be separated at the break. Will there be a moment of magic, or a horrible mistake in this second half? 48' Early possession by the reds. Alexander-Arnold hits a crossfield ball that bounces over the diminutive frame of Naby Keita. 49' Keita at the edge of the area on the volley - that one might have cleared The Kop. Pulled the trigger too early there. 50' One way traffic towards The Kop goal. No breakthrough yet. Chelsea have got plenty of their own players in their own penalty area. Liverpool knocking on the door. Liverpool bustle in the area, Salah tricks his way in, Henderson dinks it to the back post and it's SADIO MANE to head in. 53' WHAT A GOAL BY MO SALAH! Van Dijk with the ball up field - Salah cuts inside and smashes it into the top left hand corner from the edge of the area. 60' It falls into the path of Eden Hazard and he fires it at the post. I still can't get over Mo Salah's goal there. Wonderful genius work. 61' Hazard with another chance. Alisson pushes it back out but van Dijk is there to mop up. This game is opening up but LFC's quickfire two goals has given us a major advantage. 65' The last five minutes have been more like the final five minutes. It's been end to end, Liverpool have only just calmed down. 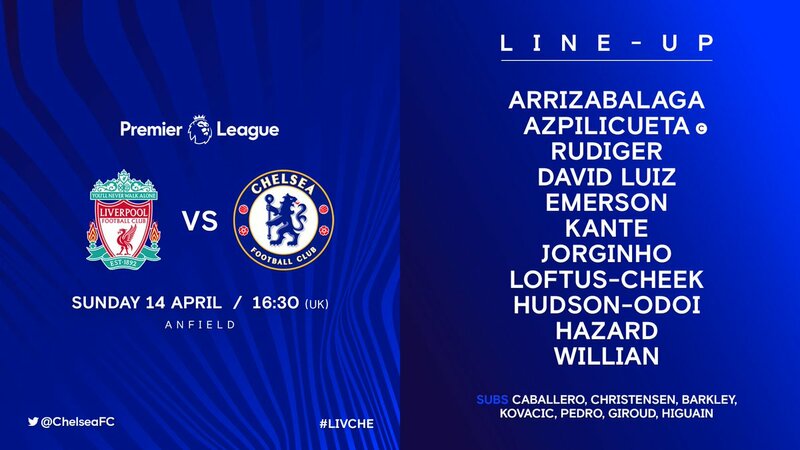 Another chance for Salah, this time Kepa saves low at the bottom left hand post. 67' Wijnaldum comes on to replace Keita. Liverpool looking for a bit more stability rather than invention. 72' Liverpool corner - it goes to the back post and Firmino cuts it back to Salah at the edge of the area. He has another dig but it's blocked. A little bit calmer now. 76' Ross Barkley on for Loftus Cheek. 77' Henderson leaves the field. Summoning the spirit of Steven Gerrard there as he gives a fist pump in the direction of his fellow players and the Kop. 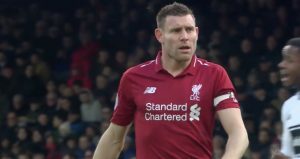 Another good performance from the Liverpool captain. It's Andy Robertson with a little slip on the half-way line, but it comes to nothing for Chelsea. 87' Sadio Mane almost in after a long ball by van Dijk. Kepa is nowhere near that but Mane's touch takes it out for a goal kick. 89' Salah goes off to huge applause. Xherdan Shaqiri is on for the reds. Great win for the reds. 85 points and back top. They're both happy at full time although doing their best in the TV interviews to keep a lid on it. It was a patient performance from the reds and a fully deserved three points. Next up for the reds - the little matter of a Champions League Quarter Final 2nd Leg.